The US Department of Energy (DOE) has selected a second group of projects to receive funding under its Office of Nuclear Energy's programme for cost-sharing to develop innovative, industry-driven reactor designs and accompanying technologies. Nine projects will receive almost $20m for cost-shared research and development for advanced nuclear technologies. 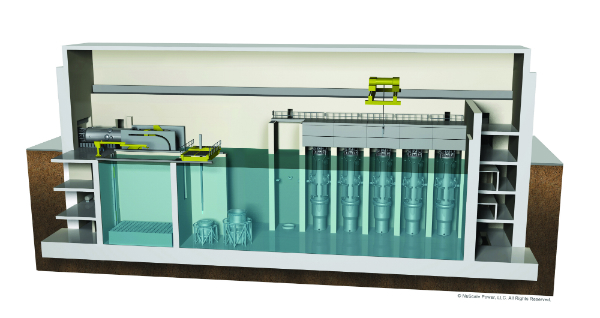 NuScale will receive $7m under the first-of-a-kind nuclear demonstration readiness project for 2018 activities during Phase 2 of the company's small modular reactor (SMR) project. These include completion of the independent verification and validation licensing report; completion of the reactor building design optimisation; and level sensor prototypic testing. Five projects were awarded funding under the advanced reactor development project pathway. These included $400,000 to Columbia Basin Consulting Group for conceptual engineering for an SMR plant based on lead-bismuth fast reactor technology. GE-Hitachi Nuclear Energy will also receive $1,925,038 to examine ways to reduce reactor plant construction and maintenance costs of its BWRX-300 reactor concept. The Electric Power Research Institute will receive $1,119,699 to further improve the models used to estimate the post-accident radionuclide releases from integral pressurised water reactors. Flibe Energy and the Pacific Northwest National Laboratory will receive $2,101,982 to examine the use of nitrogen trifluoride as an agent to remove uranium from a molten-salt fuel mixture. Holtec International was awarded $6,314,612 for research on hybrid laser arc welding for use in the fabrication of SMRs and other nuclear components. Under the regulatory assistance grant pathway, Pittsburgh Technical Institute will receive $498,000 to develop a technical basis to reduce source terms associated with Level II and Level III probabilistic risk assessment for advanced boiling water reactor designs. Two companies were also selected to receive technology development vouchers under the Gateway for Accelerated Innovation in Nuclear (GAIN) initiative launched in November 2015. This initiative aims to fast-track nuclear innovation, providing stakeholders with a means of accessing DOE research and development infrastructure to help them meet the challenges of bringing new technologies towards engineering-scale demonstration. Yellowstone Energy will receive $160,000 and ThorCon US will get $400,000. DOE in December 2017 released a funding opportunity for the money to be made available in fiscal 2018 under its US Industry Opportunities for Advanced Nuclear Technology Development. The solicitation for proposals is divided into three funding pathways: first-of-a-kind nuclear demonstration readiness projects; advanced reactor development projects; and, regulatory assistance grants. The first group of projects too benefit from this funding was announced in April with 13 projects receiving a total of some $60m. Subsequent quarterly application review and selection processes will be conducted over the next five years. DOE intends to apply about $30m of additional FY2018 funding in the next quarterly award cycle for proposals under this programme.